One poster can take up to 30 minutes to print, depending on the size and amount of graphics involved. Do the math; if there are only 3 people printing ahead of you, that’s already an hour and a half before yours even starts printing! 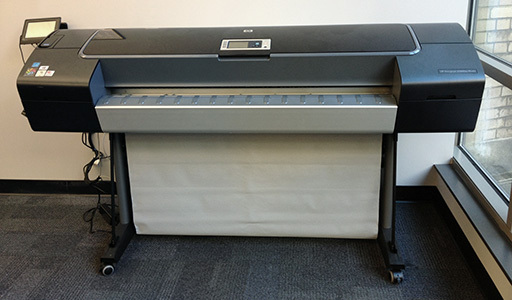 The printer at a particular location may be malfunctioning; this seems to happen with plotters more frequently than with standard office printers. The printer at a particular location may be out of ink or paper; it takes time to reorder, so have a backup location in mind in case your first or even second choice location is unavailable. Prices and other information may change without my knowledge. Call each location to confirm details that are important for your project. *This article last updated on 3/16/17. Posted by Queenie Chow at 6:16pm April 11, 2017 Posted in Digital Union Labs, Tech Tips and tagged Denman, Plotter, Poster, Printing, Research. Bookmark the permalink.